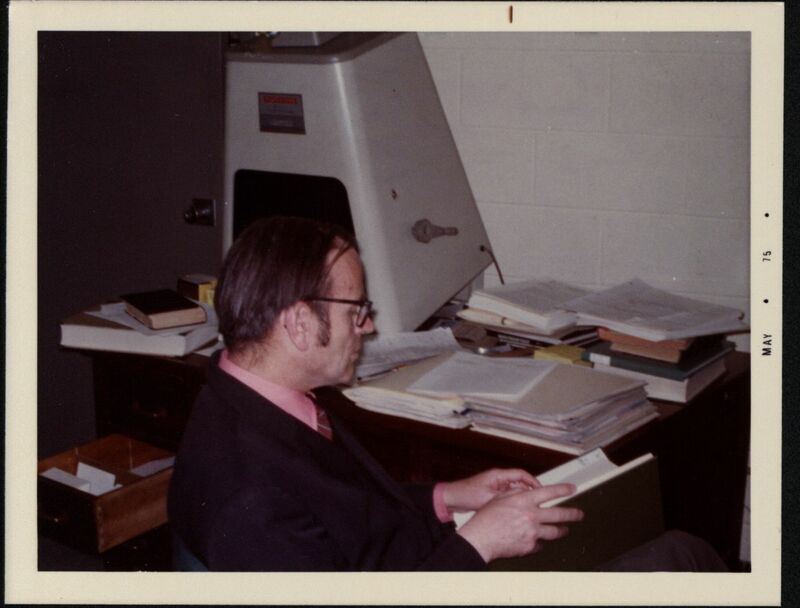 I wrote a post here some time ago about William Macomber, whose name is well known to students of eastern Christian manuscripts and who used to frequent HMML’s desks and bookshelves. 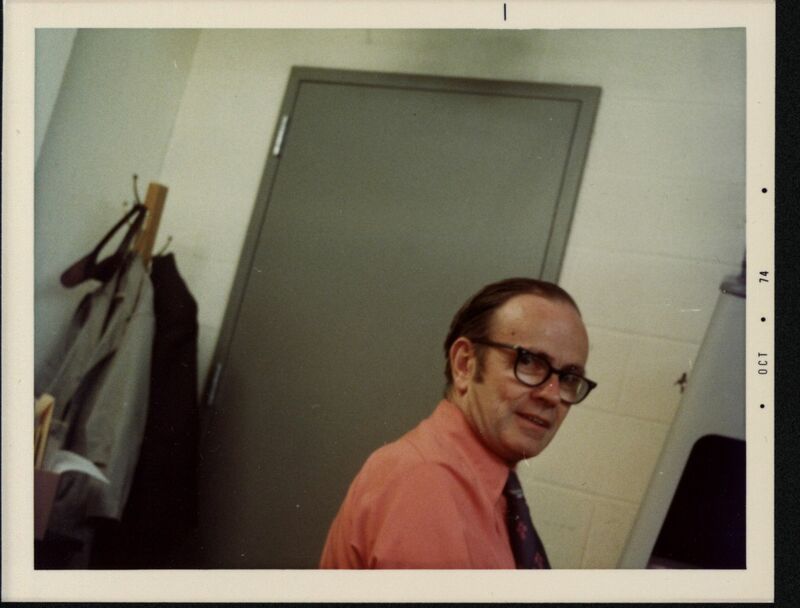 My colleague at HMML, Matt Heintzelman, came across some pictures of him at HMML from the mid-1970s, and here they are. If you go here (or click “Research / Search HMML Resources” from the banner of any HMML page), you will find three options for searching the catalog: Keyword Search, Traditional Search, and Text Search. I shall deal with each of these in turn, mainly with an eye toward eastern Christian manuscripts, but there are also on HMML’s site general remarks about using the catalog. The Keyword Search is the newest way to get into Oliver. It’s a Google-like search that will go through all the text of the catalog database (yes, that’s a lot of data). First, note that there are a few guidelines: read them. It’s Unicode compliant, so try out some terms in Arabic, Armenian, Syriac, or Gǝʿǝz (but note that there is little in Fidäl in Oliver for now; see more on Ethiopian manuscripts below). The results appear as in the screen capture below, with individual manuscripts in their own clickable block. The search term appears in red on the results page and then with yellow highlighting once you click on a particular manuscript and come to the actual Oliver record. Don’t use the forward and back arrows on your browser to navigate between the search results and the individual records, but rather the navigation buttons at the top of the search page. I should point out, too, that the data available for this kind of search is somewhat behind the pace of the data available to the other searches. All the items in the list are, of course, clickable to go to the individual manuscript. The Text Search can be very useful for going directly to particular manuscripts (other than EMML) or for doing broader searches for author or title; but in the latter case, the Keyword Search may also serve well. 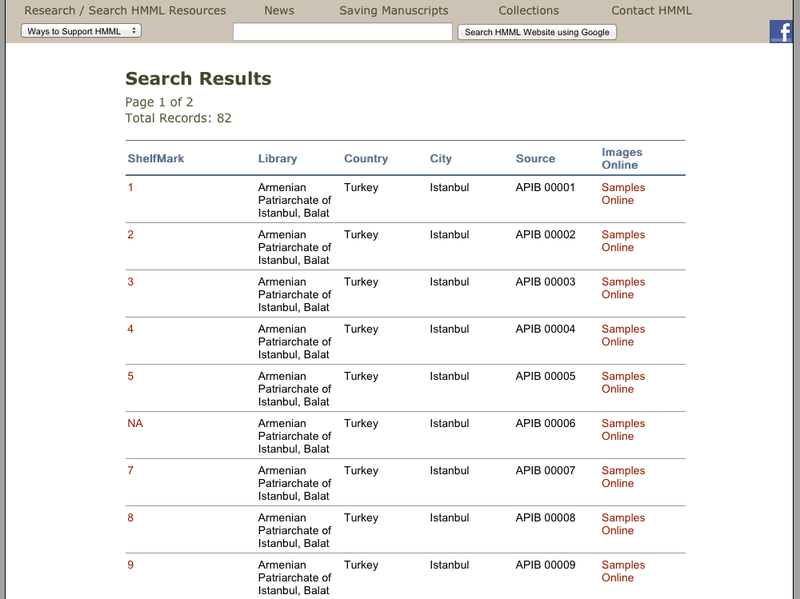 One of my own frequent uses of the Text Search is to enter the HMML Project Number, which in the case of the eastern Christian material photographed since 2003 consists of an acronym (some more perspicuous than others) and a five-digit number; this number sometimes, but certainly not always, equals the shelfmark. (These acronyms are handy to use and, since HMML is where most of these manuscripts are the easiest to access, this means of reference will perhaps become standard in some cases, as it has for the EMML collection.) If I see a reference to Mardin 130, for example, perhaps in Vööbus’ Handschriftliche Überlieferung der Mēmrē-Dichtung des Jaʿqōb von Serūg, and if I know that the manuscripts he cites as “Mardin” are in the Church of the Forty Martyrs (= CFMM) collection, I can enter CFMM 00130 in the Project Number box of this search page and go straight to the appropriate catalog record. For several months now, it has been possible to search HMML’s catalog, Oliver, with a Google-type (or Googley) search, that is, by entering a search term to be found across all fields (title, author, incipit, etc. ), but only with Roman script. 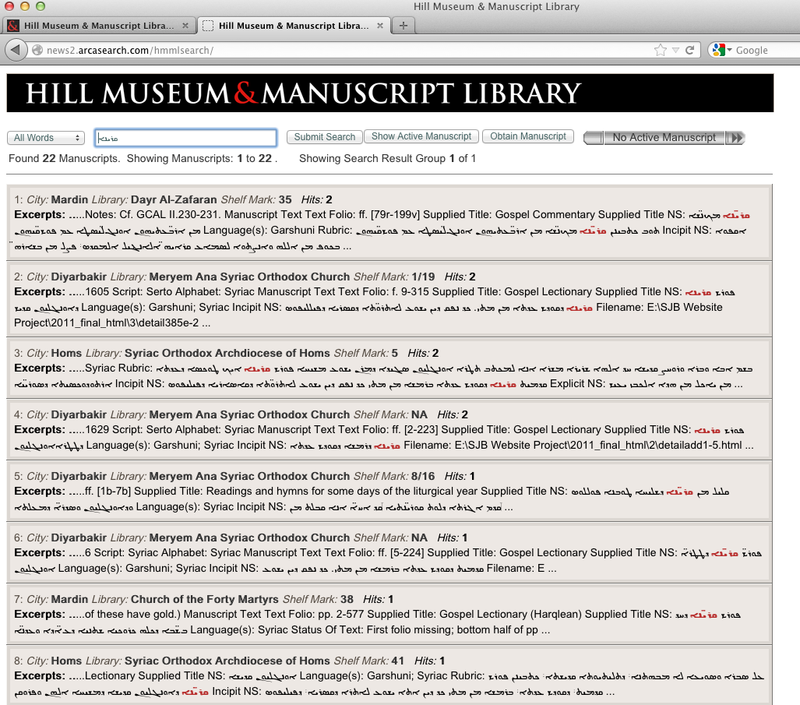 As of today, however, thanks to Unicode, it is possible to search HMML’s catalog using non-Roman scripts! This means that you can enter a term in Arabic, Armenian, or Syriac (including Garšūnī, of course), and this search will now function across author, title, incipit, and any other field where native script is used. (Thus far, all of the Gǝˤǝz manuscripts in Oliver have been entered with transliteration, but this will soon change.) Naturally, since this is a brand new feature, there may be some bugs: if you find some, please contact me (preferably by email, not as a comment to this post). Not a bad way to end the year. Happy searching!